The skin is the first layer of your immune system, serving as a shield between you and legions of germs such as viruses and bacteria. It also protects your insides from sun, cold, scrapes, cuts, and moisture. The sun, cold weather, and dry air make your skin dry. To make a little change to your daily lifestyle can help soften the skin. 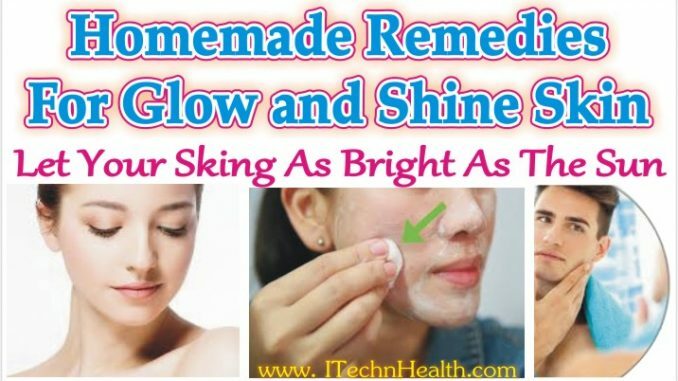 Read this article and find the method how can employ to get the glowing, shining and healthy skin. Most of men still believe that skin care regimen is something only women do. Think again! Men typically are more prone to breakouts and clogged pores. In summer, increased temperatures and glaring sunshine can wreak havoc on your skin, causing dryness, irritation and burning. Here’s what you can to breeze the sunny season with ease. Clean skin is beautiful skin. It’s important to keep your skin cleansed of sweat, dirt, and oil to prevent clogged pores and a dull appearance. Cleansing is the key to make skin shine. Clean your face at least twice a day with a cleanser or face wash. It cleans the pores and removes excess oil. Cleansers which contain Vitamins A, C and E are absorbed more into the skin. They prevent ingrown hairs and keep the skin naturally healthy. You can also use a face wash specifically designed for your skin types. Avoid rubbing your face with soap and hard scrubs. Make sure to Cleansing you skin regularly to prevent the buildup of bacteria. Bacteria can cause blemishes and make your skin texture appear rough. Getting rid of the dead skin cells via natural scrubbing is also important during summers. Exfoliate twice a week if you have oily skin and once a week otherwise. Not just in summers, you should be exfoliating about twice weekly all year round. A combination of physical and chemical exfoliation will strip dead skin cells from your face and help to prevent blockage or unwanted build up. Dry brushing is a traditional exfoliation technique to slough off dead skin and stimulate your body’s circulation. Dry brushing every day immediately makes your skin look brighter, and if you keep up the routine your skin will begin to glow. Brush your body using short, firm strokes from your outer extremities toward your heart. Brush your legs, torso and arms. Use a softer, smaller brush for your face. You can also use a wash cloth, or exfoliating mitts to scrub your skin while showering. Mistrusting your face in summers keeps your skin hydrated and fresh. Use a lightweight moisturizer with SPF 15 or above. It will help keep your skin moisturized, wrinkle free, prevent any fine lines to appear on the face and will restore the moisture balance after exfoliation. Do not leave your skin damp; apply moisturizer lotion to your skin to protect your skin from dry air throughout the day. Some moisturizers come built in sunscreen too, so you only have to apply one product. Coconut oil substance melts into your skin and gives it a beautiful glow. Aloe vera gel is a natural option that is perfect for sensitive or sun-damaged skin. Acne products which have salicylic acid can dry out your skin and make it more prone to sunburn. These products can rip off the top layer of your skin thereby making it more sensitive to UV Rays. Use these products only at night before using a moisturizer. One way you can prevent an unpleasant breakout is to only buy skincare products that are oil free. For mild moderate acne opt for a oil free cleanser that contains salicylic acid or benzyl peroxide. Apply couple of drops of olive oil over your face, elbows, knees, and the backs of your arms every evening. The oil contains monounsaturated fat, which refreshes and hydrates skin without leaving a greasy residue. Water plumps up your skin cells and makes your skin look fresh and bright. Drink minimum 8 glasses of water every day to keep your skin healthy. If you don’t want to drink lot of water then eat Watery fruits and vegetables, like cucumbers, lettuce, apples, and berries. Drink herbal tea, a glass of soda water with a squeeze of lemon for a refreshing alternative. Our skin is hugely impacted by our food choices. Include tomatoes, avocados, berries, almonds and apricots in your diet, as these food items have anti aging properties. They also act as anti oxidants which protects your skin from wrinkles thereby keeping it naturally healthy. Not to mention, drink a lot of water and flush out impurities from your body. Include more leafy vegetables, pulses, yogurt, salmon and chicken in your regular diet for a glowing skin. A glass of yoghurt smoothie with fruits such as strawberries and apple is a great way to start your day.